This is only a general perspective guide for the twelve earthly branches of the Chinese almanac and Xuan Kong flying stars for May 2010. In this, I have attempted to point out the factors that may affect you beneficially this month and also those of which you should beware of according to your animal sign. The effect on individuals should be considered within the context of the monthly Flying Stars for May. Please do not think that because, for example, you are an Pig and you read below that May 2010 will not be so good, you will therefore have a bad month. No, a positive attitude and hard work combined with knowledge of what the month ahead has in store for you will enable you to avoid many problems and disappointments. Be very careful on the 4 – 10 – 13 – 22 & 25 May as these are either year, month, separator or sha days and not good at all, so please do not plan any important tasks for these days. If you would like to be better informed of good and bad days check our free monthly almanac or our powerful date selection Tong Shu almanac software. Wealth and career luck is very good but misunderstandings in your relationships may cause you to feel a little lonely and depressed. Whilst this may sound all gloomy you have very good peach blossom this month and new love can evolve from existing or new relationships so expect overall a very nice month. All will go well if you keep yourself aware of potential loneliness and although easy for me to say but keep your head held high and do not let anyone get you down this month. Wealth luck is very good. Take advantage of this benevolent influence and make the most of your efforts. Plan for future expansion or improvement. However, should you encounter minor difficulties, do not get too excited, keep your calm and use your good judgment and big matters will become small and small matters will become nothing. Be careful of theft this month or someone trying to deceive/cheat you especially with those with an office or other important room in the south. Those Rats male or female born in 1966 should be aware of problems with the mouth, throat and chest and be careful when flying as catching a virus is likely this month so eat and drink well in May and make sure you are getting your five a day. The auspicious #8 star enters the central palace in May combined with the auspicious annual #8 star making a lovely double combination and whilst the month has many advantages with the double stars it also comes with some disadvantages and precautions should to be made along with some cures and enhancers. The northeast and southwest are extremely inauspicious in May and if you have an important room like an office, bedroom lounge etc located in these areas you need to pay attention. Use metal cures like a Wu Lou and/or a set of six Chinese coins tied in a row with red ribbon especially if you are not in good health or feel stressed. If your bedroom, office or main door is located in the northeast or southwest of your home please make sure you do NOT introduce any candles here or colours red, pink, purple, orange or any other fire colours. If you have an important room here use some blue, grey or black objects like bed covering, floor covering or cushion covers. Please take this advice as the double stars in these areas including the south are not good at all. Please avoid and do not disturb the southwest or northeast inside or out, this is one of the worst months for these two areas. To give you an idea of how seriously we take this, we have had drain problems in the southwest which falls in the southwest, because we knew the SW was very bad in May we had to ensure the work was completed in April as the amount of groundbreaking work they did would have caused us many problems if the work was carried out this month in May, it would not have been good for us at all. I am sure some of you are thinking you should not have disturbed the SW in 2010 anyway because of the annual afflictions, this is a job that had to be done and we had to select a good month to do the work and even more importantly an auspicious day to start the work as date selection is so important so the Tong Shu software comes in handy. If you have an office, bedroom, lounge or any important well used room in the south please be aware that it can cause arguments, bickering and/or legal problems in a home or business. Place a red object in the south of your home or business or carefully burn a candle each day or place a bright light, please be careful if using candles. Be careful not to place a fan on warmer days and nights in the south, SW or NE of a room, it will cause you many problems. If your bedroom, lounge, office or any other important room is located in the south please be very careful signing important papers as there could be treachery in May, ensure you read all the small print. You can also suffer from someone trying to back stab you or steal from you, so place something that is red in colour in the south such as a rug, door mat, sofa throw etc; this will help calm this negative influence. A traditional cure is a red statue of a Kwan Yin. I have my main office in the south and I will make sure if I do have to sign important papers or enter a contract I will get them triple checked and preferably not even enter into any contracts in May. Good sectors for the month of May are the centre (best), west, east and north and if your door, office, bedroom or any other important room is located in these areas your month will be good. Take a look at the annual cures and enhancers on how you can enhance your month and year even further. To activate relationships in May you can place something dark blue or black in colour in the north of your home. A quick and easy way of introducing the colour is placing a sofa throw, bed cover, rug, table cloth; it is actually very easy if you think about it. If you use symbolic items in relationships you can place a pair of Mandarin ducks or double hearts in the north or the centre of your home. With regards to wealth you should spend more time in the west and east of your home or office and enhance the east by placing a faceted crystal sphere and/or a real piece of quartz crystal. Be very careful on the 4 – 10 – 13 – 22 & 25 May as these are either year, month or sha days and not good at all, so please do not plan any important tasks for these days. If you would like to be better informed of good and bad days check our free monthly almanac or our powerful date selection Tong Shu almanac software. Take a look at your 2010 annual animal predictions and also the 2010-flying star (Xuan Kong) as you will need to follow the advice carefully to ensure a trouble free year in 2010. You can place your annual cures and enhancers at any time of the year after February 4th. 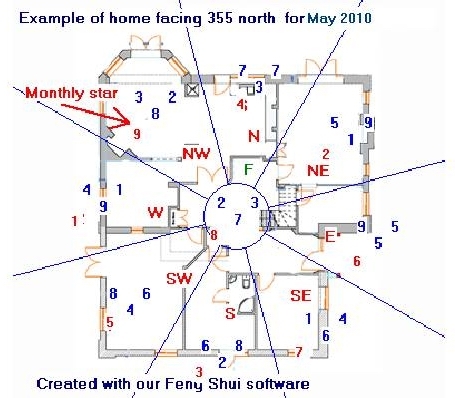 If you would like to be informed in advance of the monthly, annual and fixed flying stars for the rest of your life, maybe consider our NEW 2010 advanced flying star software, it is used by Feng Shui Masters, Practitioners and students throughout the world. There is a clash of elements during the month of May and there is a strong probability that you will encounter difficult times so do not be reckless in your actions especially with regards to finances. This will seem strange for the Ox as they have enjoyed a good time so far this year, do not worry just be cautious this month and take no risks. Be careful not to get involved in arguments at home or work as they will not go in your favour. This also applies to any potential legal problems, make sure you deal with them and do not postpone dealing with them as they will grow. Those born in 1973 male or female should be careful of accidents involving metal and in particular cars or bikes, please keep an eye on them and maybe give them a lecture on road safety this month. If you have children who are sitting exams try and encourage them to study in the north this month and place a crystal ball or globe beside their desk. Your month will be good although do not get distracted by becoming involved in the schemes of others. You must be true to your principles and success, whether in the form of promotions or recognition will be yours. Should you have decided to help someone in need, you must refrain from getting emotionally involved in your dealings with them. Choose your friends wisely and at some time this year you will find who your true friends are, this will be a good time for you with some very unexpected good news. This is the ideal time to plot and plan your ideas and projects. This may well turn out to be a pleasant but rather busy month. This is one of the best times in the year for you to write down all your personal goals and place them in the west or centre of your home in May, but make sure it is in a place that you can see it daily and one by one try and achieve all that you have written down. You would be amazed at what you can achieve with a positive outlook and do not be scared of aiming high goals. If you place some quartz crystal especially amethyst along with your goal list it will enhance it further. Helpful friends will be on your side this month and the chance of career or investment advancement is very good in May although you should be careful when signing documents or agreeing terms. This month presents opportunities for advancement, promotion and new ventures for those in business and employed. However, it is important to bear in mind the need to be charitable in your outlook to those around you. May should be a good month and potential for new romance, if you are looking to enhance relationships place a Dragon Headed Tortoise in the north of your home or office. Be careful to eat and drink sensibly in May especially if you are visiting a foreign country. Enjoy your month. This can be a frustraing month and not much will be achieved this month. You may find that plans and goals may not develop as planned or plans get changed suddenly without prior notice or indication which may become very annoying. Don’t get too upset if the changes are only a matter of schedules. Just remember to stay focused and flexible at the same time. Be sensitive with friends and family and do not turn your frustrations into problems with harsh words which will certainly bring regrets. Work is successful with good investments and success in your enterprises. If possible, be generous and charitable. Whether it is at work or at home. This should be a nice month with unexpected good news for career and a relationship, peach blossom is favourable in May so a good time to get yourself out there looking for Mr or Mrs right. If you are single look at the monthly flying star below and try and enhance the north with some dark blue colours this month to increase your chances even more, you can also wear some rose quartz to enhance especially if you were born in 1954. To further enhance your month check out the monthly almanac as it not only gives you good and bad days to do certain tasks it also tells you if it is good for your animal sign. If you get upset by others try not to let it get you down as it can affect your health so please take care of yourself both mentally and physically. For protection against physic forces wear some hematite beads or amethyst. Overall May should be a nice month. For protection you should have, a key chain pendant of a Goat/Ram/Sheep with you at all times. Wealth and career luck is good but misunderstandings in your relationships may cause you to feel a little lonely and depressed. All will go well if you keep yourself aware of potential loneliness and although easy for me to say but keep your head held high and do not let anyone get you down this month. Wealth luck is good. Take advantage of this benevolent influence and make the most of your efforts. Plan for future expansion or improvement. However, should you encounter minor difficulties, do not get too excited, keep your calm and use your good judgment and big matters will become small and small matters will become nothing. Be careful of theft this month especially if you sleep in the south. Make sure you drink plenty of water as dehydration can be a problem. For protection you should have, a key chain pendant of a Horse with you at all times. You can also place a little figurine of a Dragon on your work desk for additional support. You can expect a nice turn of events especially if you are a female Monkey. This may take the form of a possible promotion, salary increase or promising business opportunities. A good month for Monkey with satisfying results both in work and relationships. Harbour an attitude where you are able to solve problems and with confidence. But in times like this, you have to be careful with the people you are acquainted with and do not get trapped by devious plan resulting in loss of wealth. To most Monkey, it is important to give thought and care to their family life. Arranging outings or holidays with family may help improve the health and quality of family life but you must be careful in May with accidents involving a sport with high risks. Be diplomatic this month as arguments and disputes can be high in May especially if you have an important room in the south of your home, follow the flying stars advice below for further protection. For protection you should have, a key chain pendant of a Snake with you at all times. Work and business will improve with the support of people around you. On the other hand, there may be conflicts at home or with close relatives. If these are dealt with in a calm and coolheaded way, they can be resolved. You must be very careful signing contracts this month, read the documents carefully and then give them to as many people as you can to double check them. This is especially so if you have an office in the south. You should also be gracious in accepting offers of help from others. On the home front, misunderstandings are indicated so do be patient and if faced with an argument be prepared to give way. If not, small arguments may become big ones. May can bring sickness for the Rooster though so please take care what you eat and avoid visiting people in hospitals if you can although easier said than done. Overall it will be a very good month and expect some nice surprises. It is not worth taking risks this month if you can help it and think twice before making important decisions. Too much happening in the month may tax your health which can lead to illness and be very careful of what you eat and make sure you drink plenty of water especially if you are visiting foreign countries. Relationships and finances may suffer some setbacks. In the midst of the excitement and diverse activities brought on by the dynamic energy of the month, be mindful of whom your friends are and avoid gossip and bickering. The elements of the month may frustrate you and put you in an irritable state where tempers ignite easily. Know this and keep control of yourself. It is important to stay away from squabbles. Spousal conflict is possible if you do not adopt a ‘give and take’ attitude. Communicate with your loved ones, family and friends and try to be understanding. Harsh words are best left unsaid. Even though the Pig prediction is not on paper a good month in May by following the flying star advice below, all will be well. I hope you have enjoyed reading this information. As I said at the beginning, if the prediction for your earthly branch (animal) is not so good this month, you can avoid any potential problems by following our advice above and also by being aware of the monthly flying stars. Good luck and have a wonderful May.